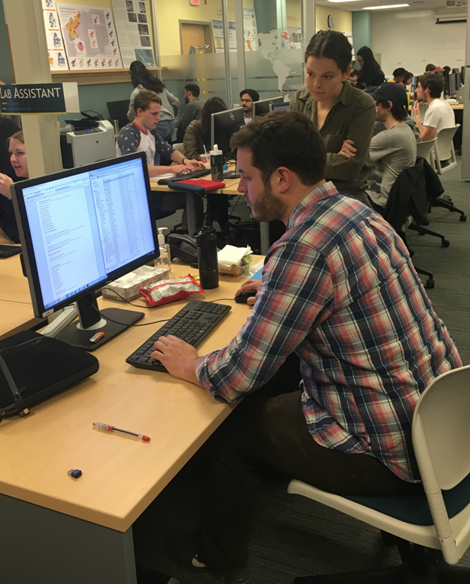 The Medford Data Lab and Boston Data Lab are teaching and research computing spaces designed to foster collaboration and innovation among students, faculty and staff across all Tufts’ schools and departments. The Data Labs provide methodological and technological support for a ride range of services and support. Additionally, the Data Labs are staffed with Student Lab Assistants who are available for immediate walk-in assistance and our team provides advanced consultations by appointment with our senior staff. Other services offered by the Data Lab include the workshop series and in-class instruction. Here is the Data Lab Brochure, with additional information. The Data Lab is managed by Tufts Technology Services (TTS), in collaboration with Hirsh Health Sciences Library, Tisch Library and Research Technology.